Thayne-san, today we’re going to visit Kototoi Dango in Mukojima. Kototoi Dango is an interesting name. Kototoi Dango was established around 1860, at the end of the Edo Period, and it was apparently named in the Meiji Period after a poem composed by the famous Heian Era Poet Ariwara no Narihira when he saw white waterfowl frolicking by the nearby Sumida River. Mukojima is a scenic area, so in the Edo Period, Edo natives enjoyed taking walks there for flower viewing, moon viewing and snow viewing and the literati composed poems. It was alive with culture. So the sweet rice dango that were named after such a heartbreaking love poem were deeply adored by the people. Toyama: Hello. I’m the owner, Kazuo Toyama. Hello. Your shop is in a really lovely location by the Sumida River. What generation of owner are you? Toyama: I’m the sixth generation. The founder of Kototoi Dango was a gardener for a lord household at the end of the Edo Period, and it started when he made homemade dango for the literati who came to have fun in Mukojima. Everyone liked the taste of his dango, and and that lead to making a tea house and then a confectionary shop, and so it is to this day. The name Kototoi Dango came about in the Meiji Era. Thayne-san, do you know the Kototoi Bridge over the Sumida river? It was named after this shop. Wow! There are a lot of examples of stores that get their names from places, but I guess the opposite can happen too. Kototoi Dango must have really been famous. 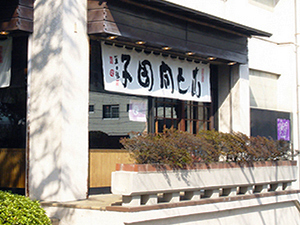 Has Kototoi Dango changed much since the founder’s time? Toyama: The light sweetness and the way of eating them with kuromoji wood toothpicks instead of on skewers hasn’t changed. 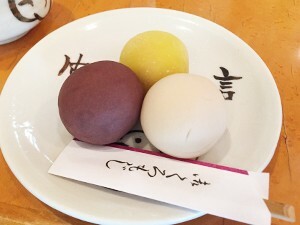 But in the Edo Period there were two colors, azuki bean paste and white bean paste, and a single serving was six dango. Then in the Meiji Era we added green plum color with sweet miso paste inside, so there were three colors. At the store, we serve them three to a plate. Thayne-san, would you first try eating some Kototoi Dango? Delicious! Three is the perfect number to eat. And the design that appears as you eat the dango is cute. Toyama: It’s a picture of oystercatchers. 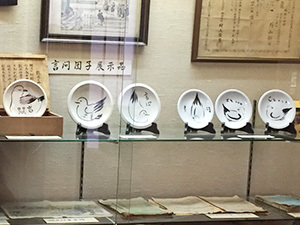 In the Meiji Era, the dishes were made in Kenya-yaki style by Miura Kenya. 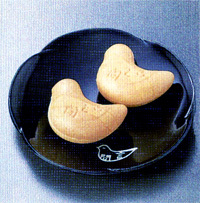 In the Taisho Era, they were made in Imado-yaki style by Shiroi Zento. And the current ones were made for us by Terada Minoru, a Seto-style potter. Even if the dishes are made by the same artist, as they grow older their art changes, and that’s interesting too. Because they are hand painted, each one has a unique flavor. 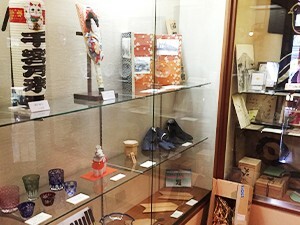 We made a gallery in the corner of the store, so please take a look at the old dishes. Toyama: Please have a look at the shop curtain too. The old one was by Nakabayashi Gochiku, the present one is by Tonomura Randen. The calligraphy is forceful, and it suits this store well. There are also hanging scrolls and woodblock prints inside, creating an inviting atmosphere. By the way, what is considered most important when making Kototoi Dango? 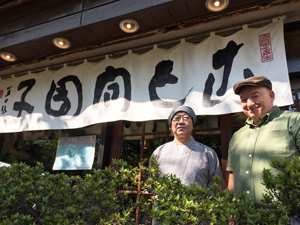 Toyama: We put all our efforts and spare no expense when it comes to procuring quality ingredients. The azuki beans in the azuki bean paste are Fuji-murasaki azuki from Tokachi, the beans in the white bean paste are white garden beans from Tokachi, and the sweet miso paste in the green plum dango is a mixture of white miso from Kyoto and red miso from Niigata. Also, the tea served with the dango is made with high quality tea leaves with a refreshing scent so that you can enjoy the dango even more. They’re simple, undecorated sweets, so everything begins with selecting the ingredients. That’s how you’re able to preserve the flavor. Do you have family rules that have been passed down from previous generations? Toyama: There are three. The first is, the owner must live at the store. That way he can continually keep an eye on every corner of the operation. The second is he must not establish any other branches. The third is he must not to make anything other than dango. But actually, we now have a special-order Kototoi Monaka. Kototoi dango only keep for one day, so we made something for the customers who were requesting something to take home as a souvenir. Please don’t tell my ancestors (laughs). Kototoi dango is certainly a delicate sweet that will soon lose its unique flavor. Yes, that’s why we try to make them in the smallest batches possible and serve our guests freshly made dango, rather than make them all in the morning and sell them all by evening. In other words, we repeat the same process over and over all day. Such careful work has been passed down for 160 years. Thinking about that kind of thing makes me sit up straight. While working to preserve the taste of your sweets, is there anything you’re trying to change? Toyama: Next to this shop there’s a jetty reaching out into the Sumida River, so I’m talking to boat captains about getting people to use it. It would be very stylish to have the customers arrive in yakatabune. Toyama: I want to try different ways of letting people know about dango and to enjoy them. Great! Thanks for showing us around today.